It's on a early morning, the cold from the night is still there, the sun is shyly piecing though the mist, the protagonist leaves his house, wearing a big cloak with a hood, we can't see his/her face so far... 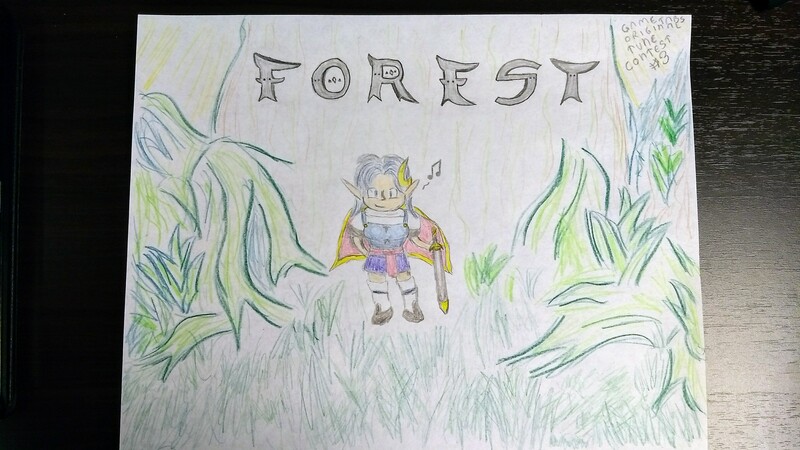 This character enters the forest... but what kind of forest and for what purpose? You guys will decide that ! What i'd like to know too is why is the hero going in the forest? It could be anything and this should not influence the music, your song must be about the forest itself and not about the action. You have until the 27th of July to submit your song in the comment section! Last point i thought it could be fun to create a story with those contest, but don't let it narrow your creativity, if we are in a fantasy world bu you want to make an industrial futuristic sounding song it's okay and i'll find a trick to incorporate it in the storyline (if you win). It represents a beautiful forest. There's a village festival in this forest (the first part of the track), but it's also a beautiful and mysterious forest (the second part). Waw that was fast ahah ! Core composing done, all the spices and actual tracking to go. So, quite a lot of work to be done, but I'm getting there! I honestly had a problem while composing this of knowing exactly what I wanted to do when I started, but couldn't keep up that momentum and had no idea what to do by the end. But, this is what I could come up with. The basic idea is that I wanted to convey something of a mysterious nature for the forest in question, inspired by the description Hash wrote for the theme with our character in a hooded cloak in the early hours of the morning and all that. As such, I ended up going for a more atmospheric approach to the composition. We only got 3 entries so far, is anyone working on something and may need extra few days ? Working on an entry. Haven't really put much time into it, but the deadline isn't until tomorrow. Will try to finish tonight. Here we go, I had way more happening in the project for a few weeks with VSTs, but ended up cutting everything and just adjusting for two acoustic tracks. As for the reason for entering this forest: it is rumored that there are witches in the forest, and those who are lost in the forest end up as ingredients in various soups and potions they cook in their shady huts. But that's just a rumor, right? Turns out we need some potent potions to save the day! In we go, getting lost on purpose. Played through the entire Chrono Trigger/Cross soundtracks on piano this month. Mitsuda was a bit of an influence here. What secrets and treasures lie within this forest? Our hero enters a haunted forest, with seemingly no way out. It carries the souls of leftovers, the ones who were partially eaten but were fated to be discarded, along with others that did not make it past their date of expiration to fulfill their role. Thus, their fragmented souls wander in purgatory, forever seeking a final destination....will our hero be able to make it out? Here is the playlist with all the entries! @hashel seems to be absent. But I think we have all the entries now. Time to vote. floflo79 - Fun opening, if a little repetitive. Enjoyed the second half as well, although it seems detached from the first, like they should be two separate songs. Can't believe how fast you always make your entries, it's impressive. Danilo_Ciaffi - I'd be too relaxed to get any carving done! Cute story. We never get soundscape music on these competitions. You handled that style well. Shrinx - You mentioned not knowing where to go with this song, and it does kind of meander about, which isn't so bad for a song about exploration. But it feels like it's building up to something that never happens. The staccato arrpeggios are nice and that clicking percussion is perfect for a naturalistic sound. Avaruussaha - It takes skill to set a particular tone with just two acoustics. Good performance. Would have liked a more distinct, creeping melody. Maybe you had that in mind with the cut instruments? soundsandstuff - Disturbing, unsettling, makes me want to throw up hotdogs; in a good way of course. @Danilo_Ciaffi Are you going to make a playlist for the first two contests? Haha thanks @hslesperance , I tried to make it spooky, and I was throroughly entertained by that hotdog gif! Floflo79: I agree the two parts don't quite match. It would have been very interesting to give the same change in mood keeping a same thematic idea. Nevertheless the piece is nice and creates the right ambience. Shrinx: I really like the texture, it has a lot of space. It also has a some tension that never resolves, which can be good thinking of the way a loop would not have points of reference. hslesperance: I like how you often can't tell at which point you're in the harmonic sequence listening to this. It actually is unsettling, in a good sense. Danilo Ciaffi - Wooden Men - I like the tone of the guitar and the flute, and the pacing which gives it a really peaceful feel as in the narrative. All the different instruments mesh together really well too, a really good five minutes of forest sound. floflo79 - Hollow Linden Forest - A cool, upbeat and happy forest music, it sort of reminds me of a forest village in zelda. A cool flute melody and it does a build up of percussion that then goes to a peaceful padding or strings part, which was a nice touch with the narrative (of entering forest from village). Shrinx - Hidden In The Trees - I like how it transitions into the main part after a lot of the percussion, I think it is catchy and reminds me of something like donkey kong country. The instruments complement each other and it gives a good ambient forest feel. Avaruussaha - Forest Of Trickery - I like the arpeggios in the beginning which give it a mysterious feel that reminds a bit of shinra tower and a bit of x-files theme. Solid guitar playing too, and cool melodies and chords. Those who get lost get turned into potions, so the hero must be cautious of what to drink! hslesperance - Beneath The Foliage - I like the piano and the feels of bass and other instruments coming together, it sounds like an upbeat adventurous kind of forest our hero wanders into. It does sort of have a chrono trigger vibe to it, cool winds and percussions arranging too.